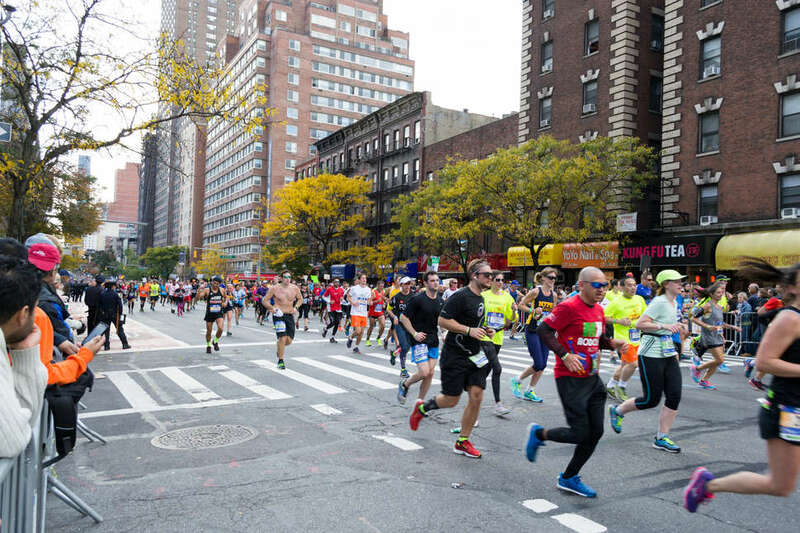 As it does every autumn, the city will host the 2018 New York City Marathon on Sunday, November 4, with over 50,000 runners winding their way through all five boroughs in hopes of finishing the 26.2 mile course. This year's marathon is on track to be the world's biggest and most popular marathon to date, and nearly two million spectators are expected to cheer from the sidelines. Though, as exciting as it all is, the whole thing can be a bit intimidating even if you're not the one hoofing it around the whole damn city. So, before you set your alarm for early Sunday to get a front-row look at the spectacle of it all, here's everything you should know about the 2018 NYC Marathon. When does the 2018 NYC Marathon start? This year, the marathon kicks off at 8:30am for the Professional Wheelchair Division, 8:52am for the Achilles Handcycle Category and select athletes with disabilities, and 9:20am for the Professional Women. The rest of the runners will kick off in four waves starting at 8:50am, with the final wave starting at 11am. Just remember, this weekend is also Daylight Savings, so don't forget to "fall back" and set your clocks back an hour Saturday night. When does the 2018 NYC Marathon end? The official end time of the race is 7:25pm, but all closed streets and bridges will reopen well before then. There will be "sweep busses" following the marathon route at a 6.5 hour marathon pace, and streets and bridges will reopen once they pass. However, the average marathon finish time for men and women is roughly 4.5 hours, so the majority of runners will likely cross the finish line between 2-5pm. What is the 2018 NYC Marathon course map? The race kicks off as it does every year in Staten Island, and makes its way over the Verrazano Bridge into Brooklyn, where runners head north through Williamsburg and Greenpoint, and into Queens. It then heads over the Queensboro Bridge into Manhattan, up the East Side and Harlem into the Bronx, and then winds back down for a final stretch along Fifth Avenue and into Central Park, which is where the finish line is. For a more detailed and specific look at the route, you can check out the official course map here. A whole bunch of roads and bridges will be affected for a good chunk of Sunday, starting around 7am, so it's worth checking before you head out in case you need to seek an alternate route. Here are all the closures to be aware of. After a pretty wet race for in 2017, this year's marathon is shaping up to be solid, weather-wise. As of this writing, the forecast calls for a partly sunny day on Sunday, with a high temperature of 55 degrees (though it'll likely be in the mid-40s during the morning when runners are in the thick of things). Fortunately, it's never been easier to keep tabs on a particular runner during all the madness, which is incredibly helpful if you want to know exactly when and where to keep your eyes peeled. The official TCS NYC Marathon app has a feature that allows you to search by runner name or bib number, and get a sense of where that person is along the course. The app also provides a section on recommended viewing locations. Alternately, you should be able to track any runner via this webpage. If you aren't able to make it there in-person, you can catch the whole thing from your couch, too. The race will be broadcast live on ABC7 from 9am to 2pm (you can also stream it on ABC7NY.com). It'll also be live on ESPN from 9am to 12:30pm. What notable athletes and celebrities are running the 2018 NYC Marathon? The NYC Marathon is typically a big draw for celebrity and other bold-named runners, and this year's is no different. Actors Teri Hatcher and Brian d'Arcy James are running, as well as Tiki Barber. You may also spot chef and restauranteur Daniel Humm, model and formal pro rugby player Nick Youngquest, or Olympic bronze medal-winning luger Erin Hamlin, all of whom will be hitting the course on Sunday.